This drug is unique (so far as I know) in that 5a -reductase, the enzyme which converts testosterone to the more-potent DHT, actually converts nandrolone to a less-potent compound. Therefore this AAS is somewhat deactivated in the skin, scalp, and prostate, and these tissues experience an effectively-lower androgen level than the rest of the body. Therefore, for the same amount of activity as another drug at the androgen receptors (ARs) in muscle tissue, Deca gives less activity in the scalp, skin, and prostate. Thus, it is the best choice for those particularly concerned with these things. To some extent, nandrolone aromatizes to estrogen, and it does not appear that this can be entirely blocked by use of aromatase inhibitors – indeed, aromatase may not be involved at all in this process (there is no evidence in humans that such occurs) with the enzyme CYP 2C11 being in my opinion the more likely candidate for this activity. In any case, Cytadren, an aromatase inhibitor, has not been found effective in avoiding aromatization of nandrolone. The drug is moderately effective at doses of 400 mg/week. 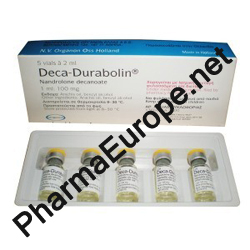 The long half-life of Deca-Durabolin makes it unsuited to short alternating cycles, but suitable for more traditional cycles, with a built-in self-tapering effect in the weeks following the last injection.